The Global Volcanism Program has no activity reports for Toshima. The Global Volcanism Program has no Weekly Reports available for Toshima. The Global Volcanism Program has no Bulletin Reports available for Toshima. 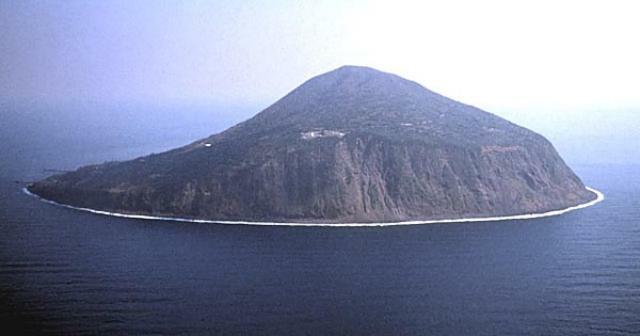 The small 2 x 2.4 km island of Toshima is located in the northern Izu Islands south of Izu-Oshima Island about 20 km W of the main volcanic front. Steep cliffs up to 300 m high ring the basaltic-to-basaltic andesite island on three sides. The summit is asymmetrically located opposite the more gentle slopes of the northern side of the island, where the village of Toshima is located. The latest known eruption of this stratovolcano occurred sometime between about 9000 and 4000 years ago, producing a lava flow from Kajiana crater. There is no Deformation History data available for Toshima. There is no Emissions History data available for Toshima. Steep cliffs up to 300 m high ring the small island of To-shima on three sides. To-shima-mura, the port village of the island, lies at the far left in this view from the west. To-shima lies about 20 km west of the main volcanic front of the Izu-Marianas arc. The latest eruption of the 508-m-high To-shima stratovolcano occurred between about 8000 and 4000 years ago. There are no samples for Toshima in the Smithsonian's NMNH Department of Mineral Sciences Rock and Ore collection. Large Eruptions of Toshima Information about large Quaternary eruptions (VEI >= 4) is cataloged in the Large Magnitude Explosive Volcanic Eruptions (LaMEVE) database of the Volcano Global Risk Identification and Analysis Project (VOGRIPA).